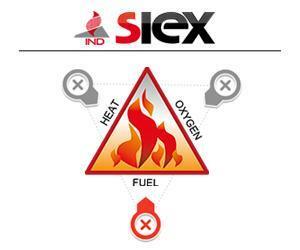 For special uses where manual intervention with flexible application equipment is necessary, SIEX wheeled extinguishers dry chemical extinguishers are an effective option. SIEX™ IND-WH systems incorporate a larger charge than a portable extinguisher agent, while maintaining manageability and portability thanks to their mounting on a wheeled hand cart, which can be handled by a single operator. They also make it easier to fight medium-sized fires with the flexibility in use that fixed installations lack, such as activities that change location or if there is uncertainty about where a fire may start. At the same time, they allow use of just the necessary dry chemical on the affected area, avoiding unnecessary cleaning tasks and costs for the agent. These manually-activated systems combine dry chemical performance, high extinguisher capacity and fast flame suppression with the larger storage capacity and manageability of a hand cart with stored pressure, ready for us.